Happiness is something that all of us want to attain. It is also something that is difficult for all of us to get. How many people in your life can say that they are truly happy? Have you noticed that the people who say they don’t have happiness in their life say they experience a lack of fulfillment, anxiety, sadness, or stress? As a therapist and counselor, I often find myself discussing the topic of happiness with my clients. In a previous blog post I shared “5 Traits Happy People Have in Common”- click here to read it. 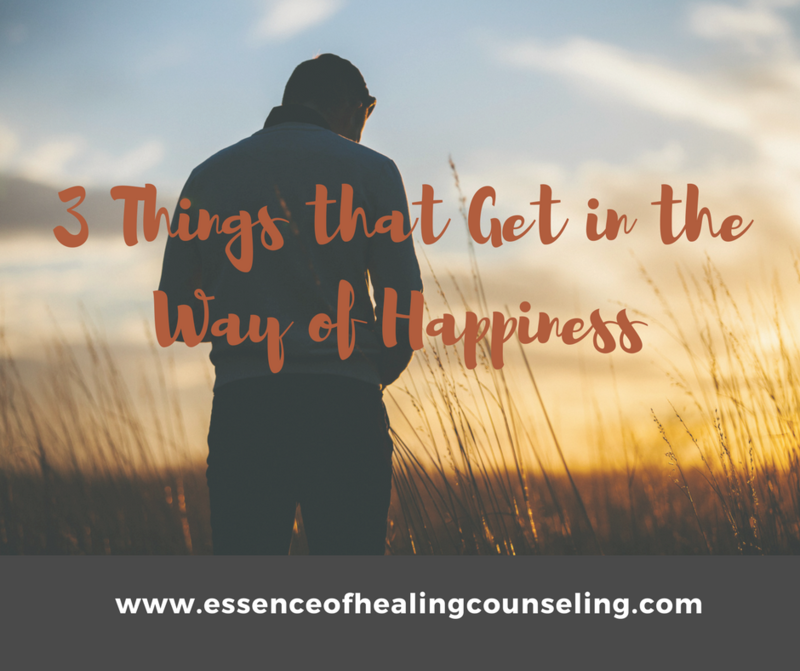 In this article, I am going to talk about the other side of the coin, three things that can get in the way of you being happy. Do you have any negative people in your life? Have you ever noticed that they are unhappy people? Happy and unhappy people both have to face challenges and obstacles in their lives. A happy person’s perspective, attitude, and actions when faced with adversity are what sets them apart. Happiness is drawn from positivity. When a happy person is struggling with an obstacle they use positivity to push through, get strength, and find a solution. On the other hand, a negative person feels powerless, gives up easily, and only sees the worst possible outcome when faced with challenges. Positive people tend to get what they want and negative people tend to complain about what they don’t have. Positivity fuels motivation, and negativity fuels frustration. Being greedy will bring you closer to being unhappy more than it will ever bring you to happiness. Don’t confuse greed and ambition. Being ambitious in a healthy way means being motivated to achieve your goals and pursuing them in ethical and just ways. Being greedy on the other hand is having an insatiable thirst to get what you want no matter what you have to do or who you have to step on to get it. People who are greedy are obsessed with material things and social status. They want to have more than anyone else. Their actions can be unjust, unethical, and they often hurt those around them. If you are jealous and envious of what others have you will always attract unhappiness in your life. Wanting to have someone else’s life will always make yours seem less than and not good enough. Desiring someone else’s material things, relationships, or career success will always leave you feeling that your life is lacking. People who are jealous and envious often take pleasure when others fail. They want to drag other people down so they can feel better about themselves. People who are envious often have unhealthy relationships with others because they don’t know how to be happy when someone else does well. Jealousy and envy feed into greed. All three put together result in a lethal combination that will keep happiness away. In this article I discussed how negativity, greed, and jealousy can get in the way of achieving happiness. People who are negative, greedy, and jealous often experience the opposite of happiness. Unhappy people usually battle with anxiety, stress, depression, and anger. Stay tuned for my next blog post where I discuss three more things that can get in the way of you being happy. Roberta Alves is a therapist and counselor at the Essence of Healing Counseling with an office located in Ft. Lauderdale. She is a Certified Anxiety Specialist and has a high success rate with eliminating anxiety from her clients’ lives. She uses a scientific and evidence based type of therapy called Cognitive Behavioral Therapy. Research has shown that Cognitive Behavioral Therapy is proven to be extremely effective in treating anxiety. Roberta is truly passionate about the work she does and loves serving her clients in Ft. Lauderdale and the surrounding South Florida areas. If you want to learn the proven techniques to overcome your anxiety call 954-393-2930 to schedule an appointment today.